Skeletonized titanium handle offers top-notch durability and a lightweight frame. Premium CPM-S35VN blade steel provides excellent wear resistance and edge retention. This type has a blue anodized titanium Care for with gold anodized hardware and a bronzed clip. The Kizer C01C includes a heavy-duty cleaver design from Chris Conaway of Sheepdog Knives. 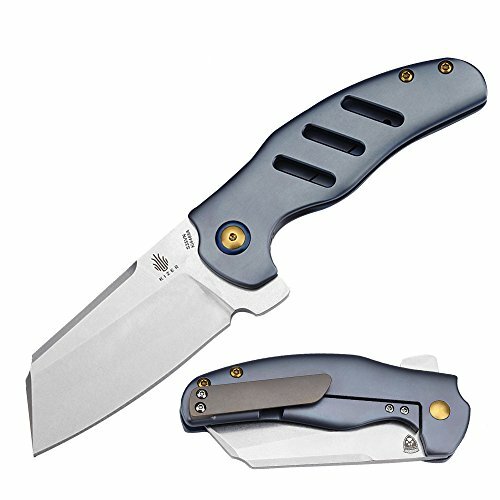 Its huge sheepsfoot taste blade is made out of premium CPM-S35VN chrome steel with a stonewashed end. The blade deploys quickly on a clean ball bearing pivot, and locks up cast. Contoured titanium Care for scales supply a at ease grip and a resilient build. This knife provides a outstanding mixture of tactical capability and a polished, fashionable look. Skeletonized titanium Care for provides most sensible-notch sturdiness and a light-weight frame. Premium CPM-S35VN blade metal supplies superb wear resistance and side retention.